It looks like Mohammad Asif is already contemplating a different career path. In his most recent communication with the media, Asif mentioned that if he is banned by the PCB, he will pursue a career in football. What are the rules on drugs in football again? I think Asif has a bigger plan. There's a master plan behind this speak. The master plan that I am talking about involves the Football World Champions - Italy. Asif has hired some underworld agents and sent them to Austria and Switzerland to abduct the Italian Goalkeeper Gianluigi Buffon. Once the abduction has taken place, Buffon will be transported to Attock Jail in Peshawar and no one will see him again. The master plan involves Mohammad Asif going through a slight makeover with blue contact lenses and light hair-dye and taking buffon's place with the Italian football team. The Italian mafia may be strong, but Pakistan's is stronger. Asif, sitting in a Dubai jail, is calling the shots and the master plan has been put into action. Nice one Q. The pics look quite similar actually. heheheheheh , never realised how alike they look. 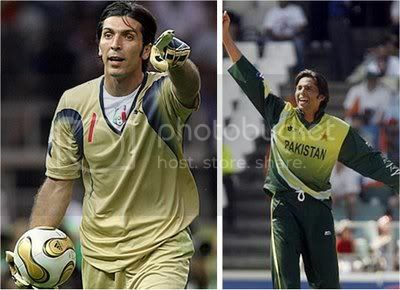 At least buffon is no buffoon, sadly same can not be said of Asif !